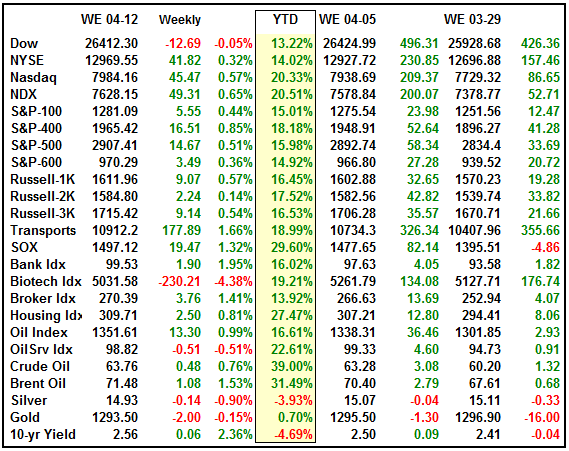 Never short a dull market and especially when Dow components are in the headlines. When only five Dow components added 269 Dow points and that was the total gain for the day you could assume it was a short squeeze. Disney added 98 points on its streaming announcement. Boeing added 69 points after the CEO said they had flown 96 test flights of the 737 Max with the new software. 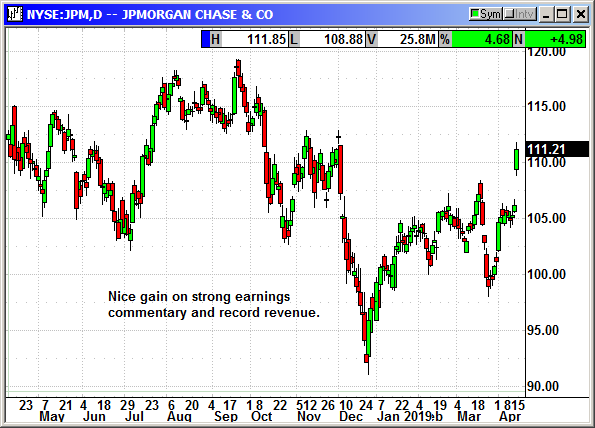 JP Morgan added 36 points after strong earnings and Goldman added 36 points because of their earnings on Monday and the strong guidance from JPM. 3M added 28 points because strong Chinese economic numbers make a global recession less likely. So how do you really know a rally is a short squeeze? When the Dow gaps open nearly 300 points and then trades sideways the rest of the day. A real rally moves steadily from the lower left of the chart to the upper right, not gap up vertically. The other indexes followed the Dow higher but with a lot less enthusiasm. The Nasdaq was up only 4 points at 11:15 when the Dow was up +165. 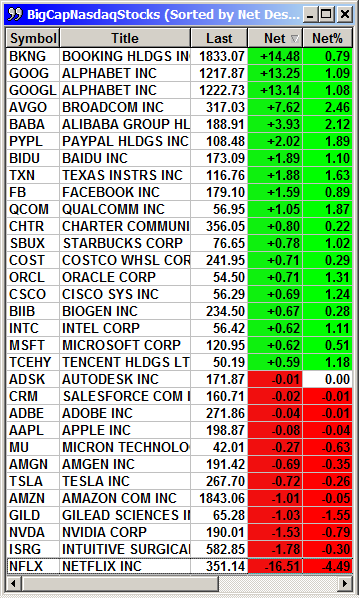 Tech stocks only reluctantly rebounded when the Dow went back to +250 intraday. The Russell failed to participate and barely avoided going negative intraday. 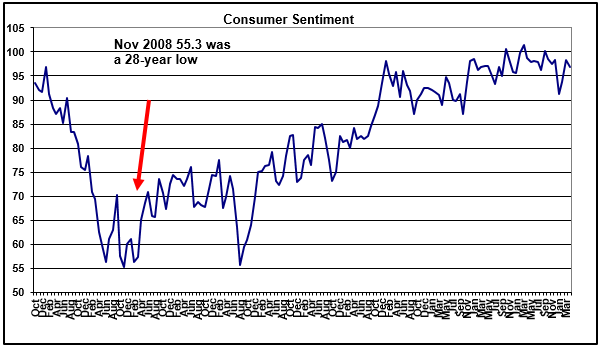 Consumer sentiment fell unexpectedly in April from 98.4 to 96.9. That is not a big drop, but it was the first in three months and with employment picking up again analysts expected it to continue rising. The present conditions component rose from 113.3 to 114.2 but the expectations component declined from 88.8 to 85.8. Analysts blamed the tax cycle and consumers facing the challenge of paying their taxes for depressing sentiment. Weather could have also been a problem with some serious snowstorms crossing the nation. That affects income because people don't go to work and those that do are fighting the bad roads. Everything impacts sentiment. Seventy-five percent of respondents said it was a good time to make a major purchase, an increase of 1%, and 60% said it was a good time to buy a vehicle, down -2% and 66% said it was a good time to buy a house, -2%. Despite the decline it is still high on a relative basis. Sentiment is only down 1.9 points from this time last year. Import prices rose 0.6% in March after a 0.6% rise in February. The rise in oil prices was the major culprit in the increase. Excluding petroleum, prices rose only 0.2%. If you exclude fuels, prices actually declined -0.2%. Crude oil prices rose 4.8% in March after a 13.7% rise in February. Imported natural gas prices rose 42.3% in March although they declined sharply in April. Export prices rose +0.7% also due to the rise in energy prices. We exported the most oil and gas ever in March. This report was ignored. 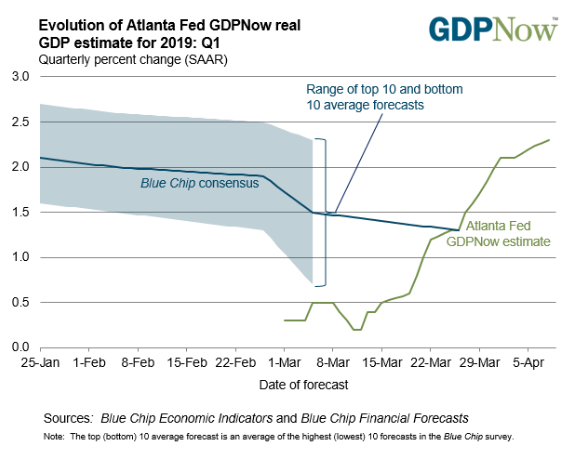 The positive economic reports for the week combined to lift the Atlanta Fed real-time GDPNow GDP forecast to 2.3% for Q1. This is a significant improvement from the 0.2% forecast back in early March. Interest rates rocketed higher after the economic news from China and the EU extended the deadline for Brexit until October 31st. Those two headlines cleared a couple of big clouds from the market. Overnight headlines from China showed a 14.2% rise in exports that blew past expectations for a 7.3% rise. However, imports declined -7.6% and far more than the -1.3% expectations. The March trade surplus came in at $32.64 billion and well over the $7.05 billion Reuters expected. The trade surplus with the U.S. rose from $14.72 billion to $20.5 billion. That brought the total for the quarter to $62.66 billion and a number I am sure the White House is impressing on trade negotiators. 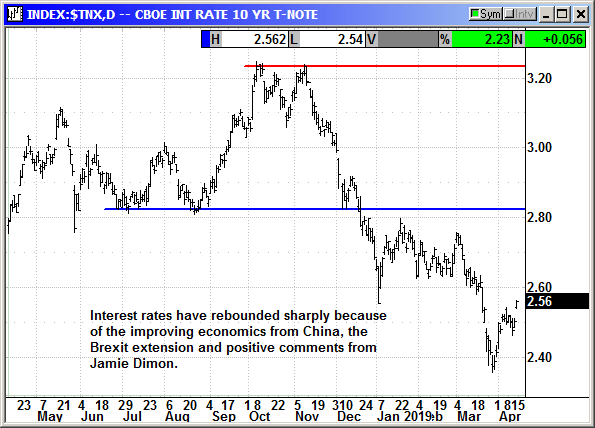 The positive export number, Brexit extension and positive economic comments from JP Morgan CEO Jamie Dimon all combined to cause a sell off in treasuries and rise in yields. The yield on the 10-year rose to 2.56% and a four-week high. 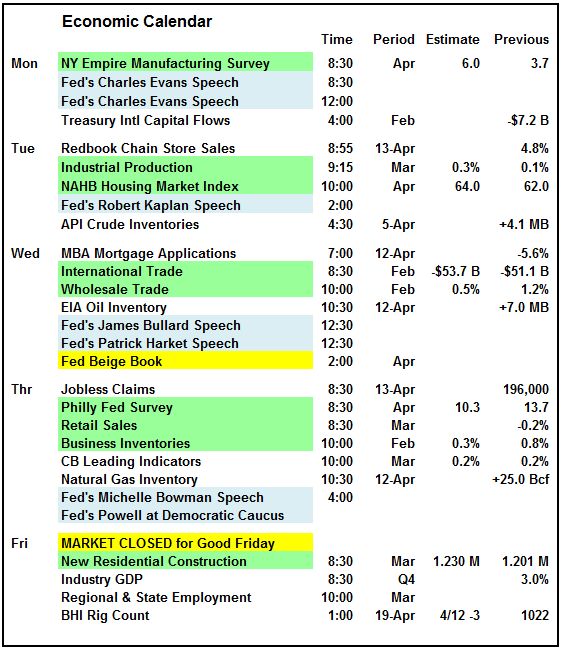 The calendar for next week is busy with the most important reports the Philly Fed Survey and the Fed Beige Book. The retail sales, wholesale trade, etc, are important to the overall picture but they are not market movers. The Beige book is not normally a market mover, but it does fill in the economic blanks for each of the Fed regions. If there are any developing areas of weakness, they will show up here first. Friday kicked off the Q1 earnings cycle with the first of the big banks. That cycle continues next week with Citigroup and Goldman Sachs on Monday. The tech sector gets into the swing with IBM and Netflix on Tuesday. The pace slows as we near the Good Friday holiday and the long weekend but accelerates the following week. Of the 29 S&P companies that have reported, 79.3% have beaten estimates for earnings and 48.3% have beaten on revenue. The current earnings projection is for an earnings decline of -2.3% on a 4.9% increase in revenue. For Q1 there have been 85 guidance warnings and 31 guidance upgrades. The current forward PE is 16.9. Next week there are 50 S&P companies reporting. 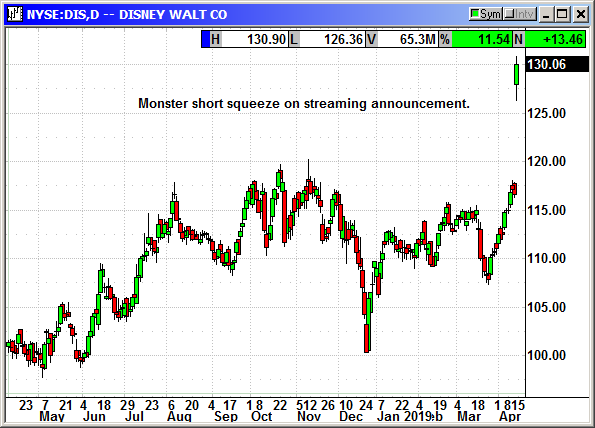 The big market driver on Friday was Disney (DIS) and the streaming announcement. The Mouse House announced a $6.99 monthly service or $70 annually with access to 7,500 TV shows and more than 500 movies. They are targeting 60-90 million subscribers and expect to be profitable in fiscal 2024. They are going to invest $1 billion into original programming in 2020 and that will rise to $2 billion by 2024. That pales compared to the $15 billion Netflix is expected to spend in 2019. What Disney has working for it is their studio movies that are released to theaters. That budget is not a part of the streaming project. That means they have Marvel, Pixar, Lucas Films, etc, all making feature length films for the box office that will eventually make their way to the streaming system for no net cost to Disney+. The cost will have already been covered by the revenue from the box office. The Marvel characters are just one segment of the highly profitable Disney enterprise. Star Wars would be another. These are going to be a staple of the Disney+ streaming portfolio but how many times can you watch these movies before you glaze over? Disney has 70 years of content available to stream but I Love Lucy and Gomer Pyle reruns are not going to be high on the list. As a viewing public we have become spoiled to the high dollar, high graphics, high dollar talent productions that we have today. This is where Netflix can compete. Their $15 billion a year in original content is going to be producing 120-140 shows a year and Disney is producing a dozen. Analysts and investors alike were impressed by the Disney+ announcement. They do believe families will add another subscription to their list and very few analysts think they will cancel Netflix or Amazon Prime. This is the cost of entertainment for the future and if you have been to the movies lately you realize how cheap this package will be. You can't go on a date to the movies for much less than $50 and taking your wife and kids to the movies is cost prohibitive. This is going to seriously damage brick and mortar movies over the long term. With 7 streaming services battling it out for control of your TV the prices are going to remain low. The streamers can afford to keep prices low because only a couple million viewers will go see a movie in theaters but tens of millions will stream it and those streaming fees are monthly, every month. Disney also owns Hulu and they expect to reach 40-60 million subscribers there as well by 2024. They currently have 25 million subscribers. Add in ESPN+ and Disney is going to appeal to almost every type of viewer. Netflix has 139 million subscribers and is expected to double over the next five years. There will be a streaming war as Disney, AT&T Warner Media, Verizon, Apple, Amazon Prime, Hulu and others all compete for the same eyeballs. Fortunately, none of them are exclusive and you can have as many subscriptions as you can afford. Disney shares spiked $13.50 (11.5%) to an all time high at $130 on six times average volume. 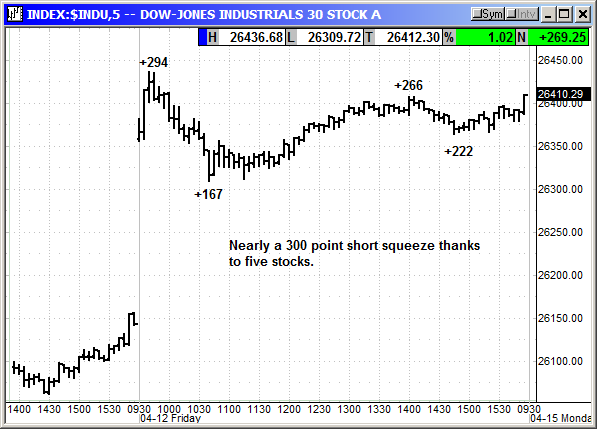 This added 98 Dow points and helped to power the short squeeze. 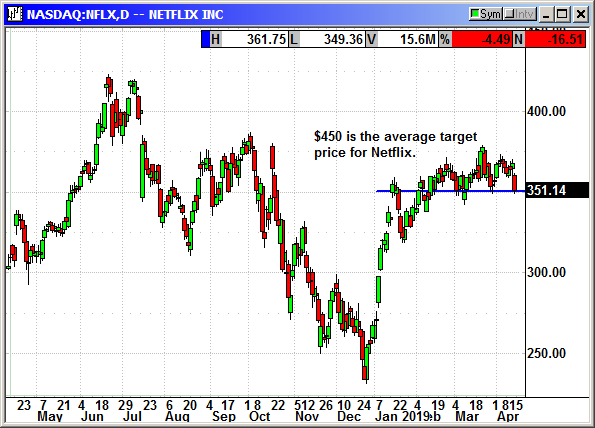 Netflix (NFLX) shares declined -$16 (-4%) to $351 on the news. Netflix reports earnings on Tuesday. JP Morgan (JPM) reported earnings on Friday of $2.37 that beat estimates for $2.35. Revenue of $29.85 billion was a new record and easily beat estimates for $28.44 billion. Net interest income rose 8% to $14.6 billion and also beat estimates for $14.4 billion. The retail loan portfolio rose by 4% and deposits rose 3%. Credit card sales volume rose 10%. There was a 12% spike in advisory revenue and 21% rise in debt underwriting. Investment banking revenue rose 44%. Everything was not rosy. Fixed income revenue fell -8% and equity market revenue fell 13%. Shares spiked $5 after CEO Jamie Dimon said, "Even amid some global geopolitical uncertainty, the U.S. economy continues to grow, employment and wages are going up, inflation is moderate, financial markets are healthy and consumer and business confidence remains strong." He also said he did not expect a recession in 2019, 2020 or 2021. They bought back $4.7 billion in stock. 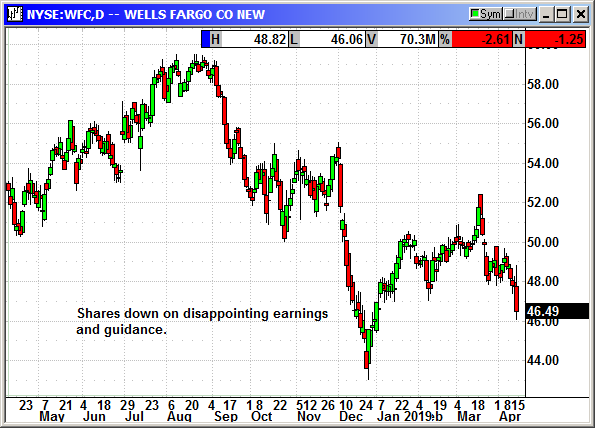 Wells Fargo (WFC) shares went the opposite direction after reporting adjusted earnings of $1.03 that missed estimates for $1.09. Revenue declined to $21.6 billion but beat estimates for $20.9 billion. Net interest income was nearly flat at 12.3 billion, up only slightly from $12.2 billion. Non-interest income declined from $9.696 billion to $9.298 billion. Wells is a big mortgage lender and mortgage banking income rose from $467 million to $708 million. The challenge came from weak guidance. The CFO said net interest income would decline 2-5% in 2019 compared to prior forecasts for a 2% rise to 2% decline. For Q1 net interest income was down -3% from the prior quarter. They also cancelled their expense targets for 2020 after the departure of the CEO. The bank raised its loan loss provision from $654 million to $845 million based on less favorable economic conditions. 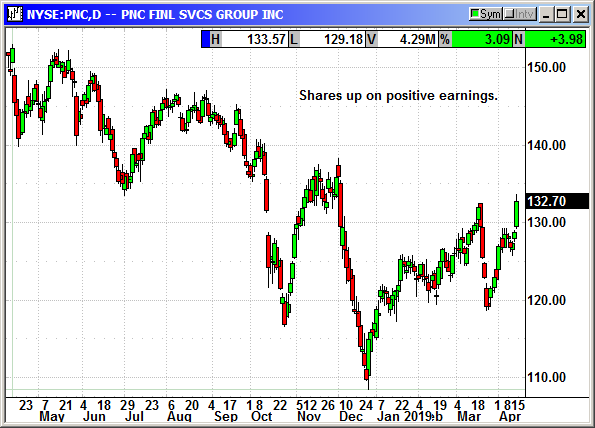 PNC Financial (PNC) reported earnings of $2.61 that beat estimates for $2.59. That was a 7.4% increase from the year ago quarter. Revenues of $4.29 billion beat estimates for $4.24 billion. Net interest income rose 5% to $2.48 billion. Non-interest income rose 3% to $1.81 billion. Loans rose 3% to $232.3 billion and deposits rose 1% to $271.2 billion. However, income from corporate and institutional banking declined 11% and asset management income declined 17%. Shares rallied $4 on the earnings beat. Uber finally filed to for a $10 billion IPO that could value the company at $120 billion. They have raised $24 billion in private capital. Unlike Lyft, Uber is an integrated company that functions in 700 cities in dozens of countries. In addition to 12 different types of rides you can order from the App, they have Uber Eats where you can order food from more than 220,000 restaurants in more than 500 cities and have it delivered to your door. More than 15 million people ordered meals in Q4. There is also Uber freight, which had revenue of $125 million in Q4. They have ride share bikes and ride share scooters. They are currently buying competitors in multiple countries. They had 22,263 full time employees at the end of 2018 with 11,488 outside the USA. They have 3.9 million drivers on the platform serving 91 million "monthly active platform customers." In 2018 it generated $11.4 billion in revenue and lost $1.8 billion. In the S1 they say Uber may never reach profitability and that should be a red flag. They are using the Amazon model of if you build it, they will come. In doing so they are trying to branch out into every conceivable mode of transportation including developing their own self driving operating system. They are the Amazon of the transportation sector. While Uber is vastly larger and more complex than Lyft, they must eventually make a profit to stay in business. They are hoping one of their offshoot efforts will become viable and lift them out of the loss column. Meanwhile LYFT shares continue to move lower. 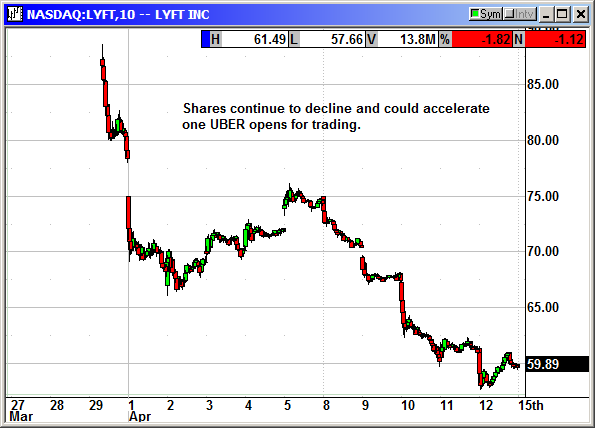 Once UBER prices and opens for trading, I expect LYFT shares to trade under $50 on their way to significantly lower levels. 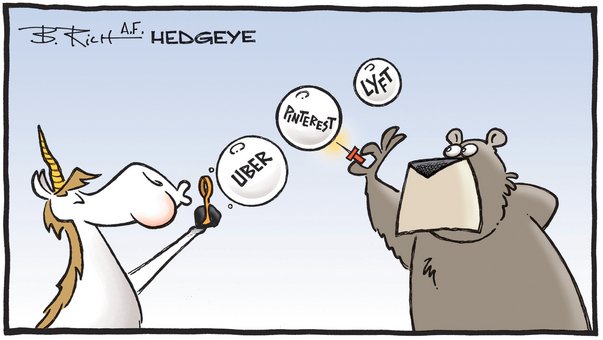 Hedgeye: Are unicorns worth buying? 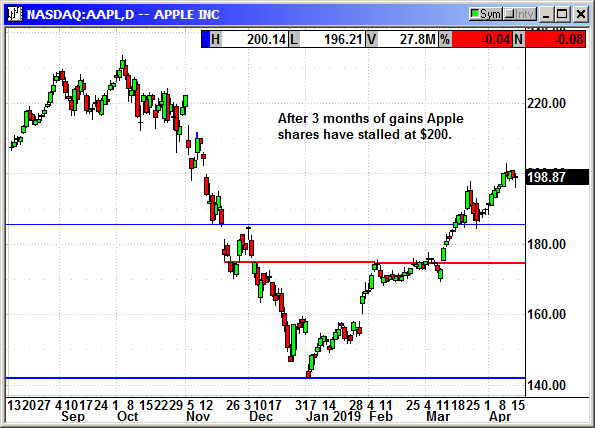 Apple (AAPL) is suffering from iPhone fatigue. For the second time in a week an analyst has cut their rating to "sell." New Street Research said demand trends are fading and the consensus view of earnings is too optimistic for Q2. He based this analysis on the sales trends from 2016 when sales hit an air pocket following the iPhone 6S launch. He is expecting sales to increase in Q4 when the new models are announced. He said the services revenue forecast is too aggressive because it requires new iPhone users to sell new services. Existing users already have the services they want and there is very little services growth in the installed user base. He is also less than optimistic about the recent announcement for new subscription services. Apple was vague on details and costs and until the services are actually launched, he is not applying much value. Apple TV is an example since it was launched long ago and never contributed meaningfully. HSBC also cut shares from hold to sell. China's smartphone shipments declined 6% in Q1 and the number of new handsets activated in March declined 35%. Q4 was the fifth consecutive decline in global smartphone shipments with a year over year decline of 7%. The survey showed demand for premium phones with high prices declined significantly. In Q4 IDC said iPhone sales in China fell 20%. Google is set to roll out the new models of the Pixel phone in May and Samsung will debut new models later in the summer ahead of the iPhone announcement. GE agreed to pay a $1.5 billion fine over problems with sub-prime mortgages in its WMC Mortgage unit prior to 2008. The fine is due to the unit concealing the poor credit quality of the loans and for lax fraud controls when packaging the loans into securities sold to investors. WMC was acquired by GE Capital Corp in 2004 and originated more than $65 billion in loans over the next three years. GE sold WMC in 2007. The Dept of the Treasury ranked WMC as the fourth "worst subprime originator." 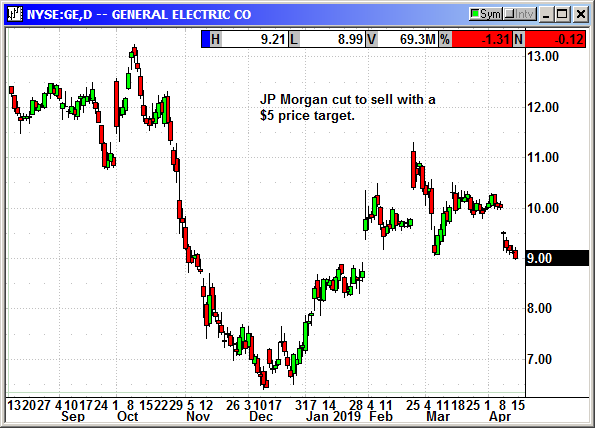 Earlier in the week JP Morgan cut GE from neutral to sell with a price target of $5. How is that Medicare for all working out for you? If you are a shareholder in the health care sector it has been painful. 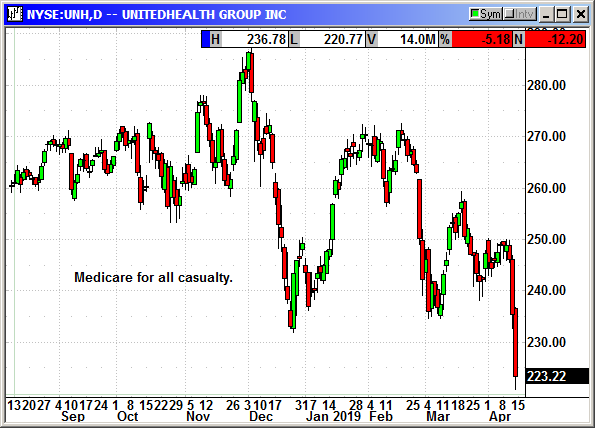 UnitedHealth (UNH) has declined almost $30 over the last three days since the democratic hopefuls have adopted that as one of their main platform issues. For people bad at math the Bernie Sanders plan would cost about $3.3 trillion and eliminate private health insurance as we know it. It has no chance of passing even if he was elected simply because of the cost. While young people like the sound of FREE healthcare, they would not like the 35% tax hike it would take to provide that free care. 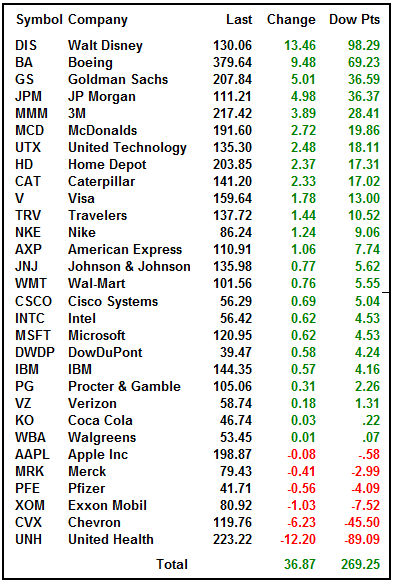 This is a major buying opportunity for these companies. 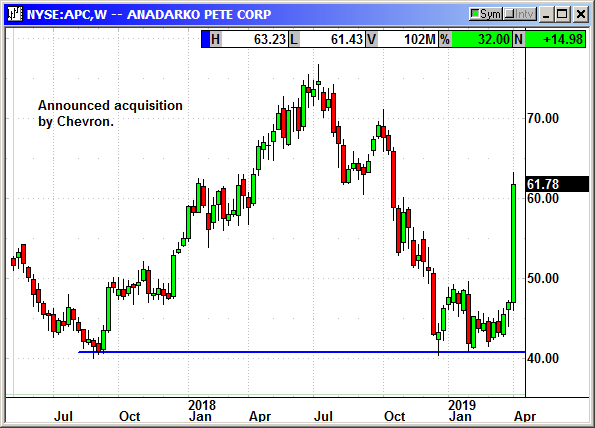 Anadarko Petroleum (APC) announced it had agreed to be acquired by Chevron (CVX) for $33 billion in cash and stock. They will also assume about $5 billion in Anadarko debt. This will create the second largest publicly traded energy company. 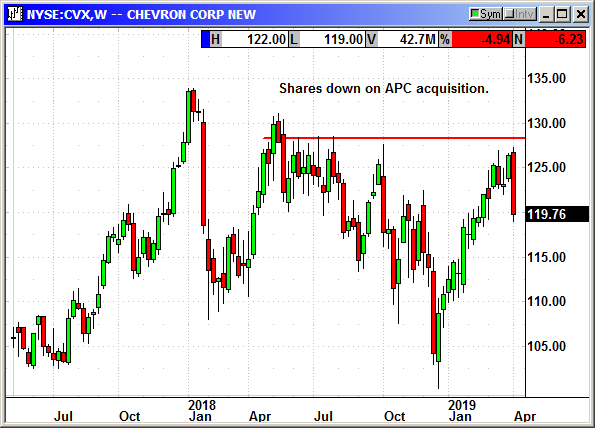 Anadarko shareholders will receive 0.3869 shares of Chevron and $16.25 in cash for each APC share they own. The deal is slated to close in the second half of 2019. Chevron also said it would increase their current stock buyback program from $4 billion to $5 billion. Chevron said the deal would produce about $2 billion in annual synergies and be accretive to free cash flow after one year. Chevron shares declined $6 on the announcement to erase about 42 Dow points. I personally think it is a great deal. I have always liked Anadarko and Chevron as my two favorite energy companies. 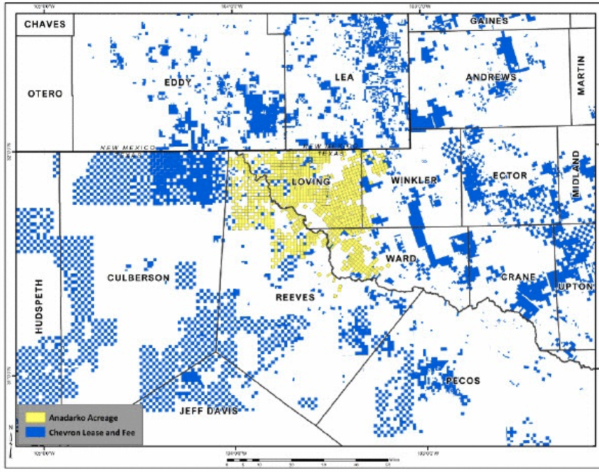 Chevron and Anadarko are both large landholders in the Permian with many adjoining leases. This will give Chevron an almost continuous 75 mile wide property position in the best areas of the Permian. Chevron has 2.2 million acres in the Permian and Anadarko has more than 589,000 acres. Anadarko also has world class deepwater properties in the Gulf of Mexico and a monster gas/LNG development in Mozambique. 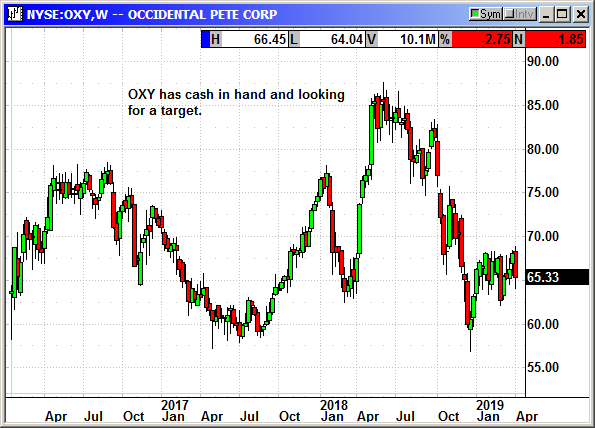 Occidental Petroleum (OXY) had bid MORE than $70 per share in cash and stock and had more cash than the Chevron bid. However, OXY is not as powerful as Chevron on the world stage and they would have required a shareholder vote for approval. Reportedly, there were also some structural issues with the OXY bid. According to reports, OXY is considering its options for a higher bid. The Chevron/Anadarko breakup fee is 3% or roughly $1 billion. The combination of these two companies could start another land rush in the Permian. Companies that have developed significant acreage positions and could be acquisition targets include Apache (APA), Pioneer Natural Resources (PXD) and EOG Resources (EOG). Concho (CXO) and Noble Energy (NBL) were also mentioned but their positions are significantly smaller. If another major like Exxon, BP, Shell or Total decide to ramp up in the Permian they are likely to go for the big companies where they can actually benefit from the increased scale rather than a smaller company that would not provide the big increase in reserves. 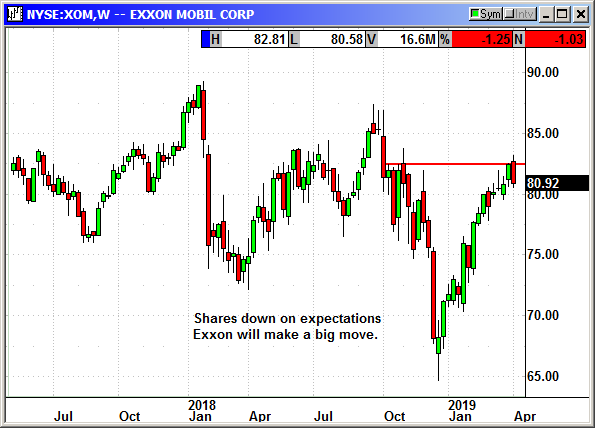 Exxon bought XTO back at the height of the oil boom a decade ago just before prices crashed over the next ten years. Exxon had a case of severe indigestion since XTO was primarily natural gas and one of the largest producers in North America. Gas prices collapsed from $12 to less than $2. Exxon has evolved XTO and they are now the most active operator in the Permian, according to XTO and Exxon with more than 50 active rigs. Exxon is planning to increase their output in the Permian by 80% to more than one million Bpd by 2024. They are building 30 oil and gas processing centers in the Permian to handle their future production. Exxon has the most to gain by increasing its 1.6 million acre position and consolidating by filling in the lease gaps with a large acquisition. They have been actively buying 20,000-30,000 acre leases in recent months. EOG has more than 850,000 Permian acres. Pioneer has more than 750,000 acres. Don't forget Occidental is still an active acquirer at this time. 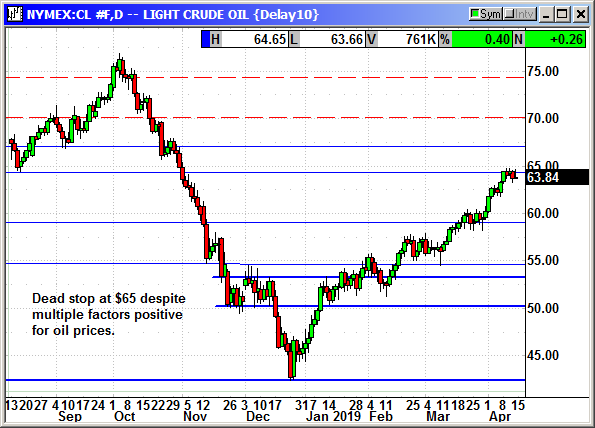 Crude prices have plateaued at $65 despite conflict in Libya and economic collapse in Venezuela. The Russian comments about ending their production cuts in June has the market worried. Since oil prices normally peak around Memorial Day, I still expect them to rise from here. 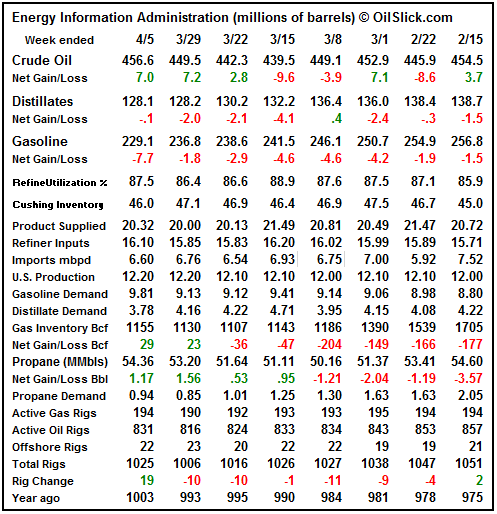 Inventories rose the last three weeks because refiners are still in their maintenance period and they are still trying to deplete supplies of winter blend fuels ahead of summer fuel production. This inventory build is going to reverse into declines very soon as refinery utilization increases over 90% into the spring driving season. 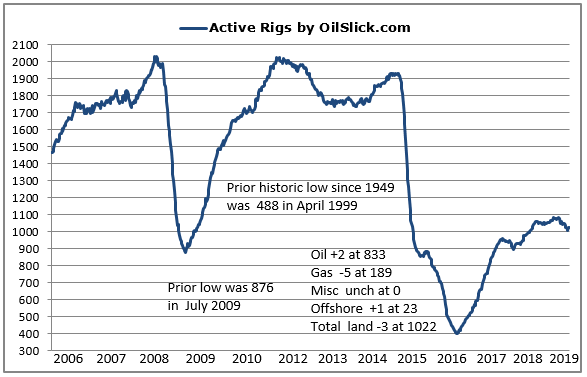 We only added two oil rigs last week after the 19 rig spike the prior week. Gas rigs declined by five. There is still a lack of transport capacity for Permian crude so wells drilled now will go into the massive backlog of uncompleted wells. 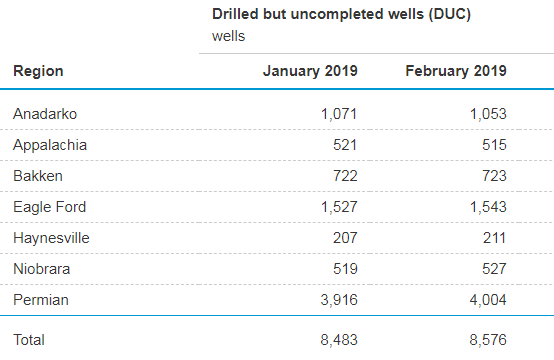 There were 8,576 drilled and uncompleted wells at the end of February and rising. With the S&P only 23 points from a new high, I would really be surprised if we did not reach it. As I have said all along, the prior highs act like a tractor beam in a bullish market. 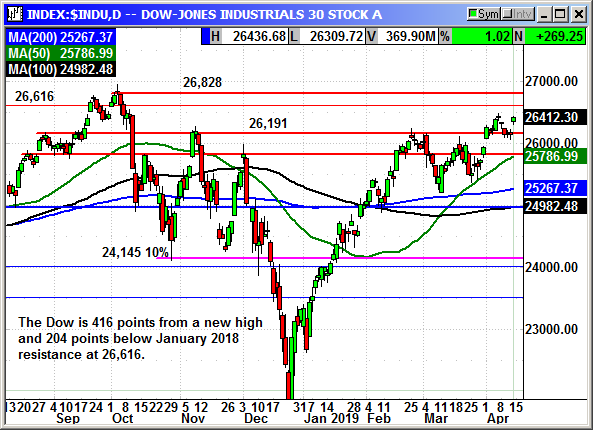 The Dow is still 416 points below its prior high at 26,828 but that is just one good week with a couple Dow components posting large gains each day. 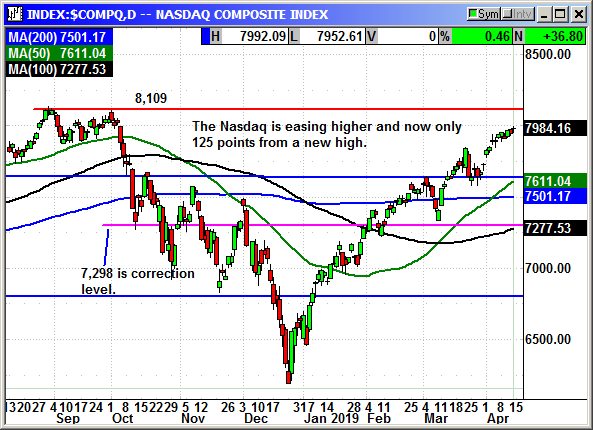 The Nasdaq is about 125 points from a new high. 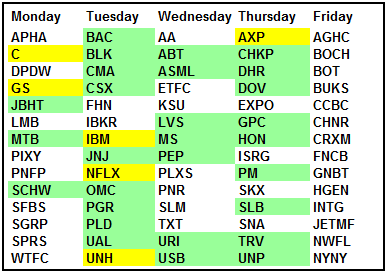 All of these indexes could easily see those levels reached this week if we have some positive earnings guidance. On the headline front, the comments from the White House suggest all the hard points have been agreed on the China trade talks and they are just finishing up on the punctuation and presentation. Once President Xi approves the final draft, they will schedule a Florida summit and that announcement will be the equivalent of a done deal. Whether that has any upward lift left is unknown. We have been trading on expectations of a deal for so long, there is a serious risk of a sell the news event. It might not be on the day it is announced or concluded but shortly thereafter because that goal will no longer be present. The earnings are the wild card. If they continue to be positive and the forecast creeps back into positive territory and guidance is decent, we could actually see some further market gains. However, after rising 20% in 2019, the decline into the summer doldrums could be especially frustrating. We all would like to see the market skip the normal summer slowdown and I would also like to find a winning Powerball ticket in my mailbox. It is possible we will not see a market pause over the summer but highly unlikely. Because it is unlikely there will be a lot of investors betting on that to happen. A funny thing happens when the herd moves in the same direction. The market has a tendency to move in the opposite direction. Time will tell what summer will bring and there is nothing we can do but watch and wait. There is no resistance between Friday's close and the prior highs. The only thing holding us back is a reluctance to buy a market top. The Dow closed at 26,412 on Friday and 12 points below the close on April 5th. Normally that would be resistance, but I doubt it will be this week. 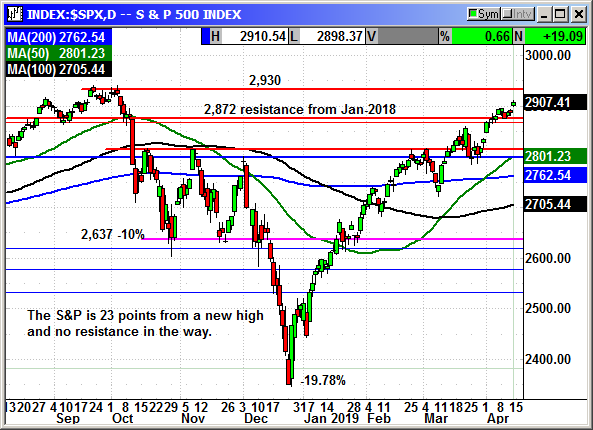 The market is too close to the prior high at 26,828. However, the January high at 26,616 could be light resistance. That would be the head and shoulders level in a perfect chart, but I doubt that will occur this close to the high. I could foresee a double top, so we need to watch for that in the days ahead. 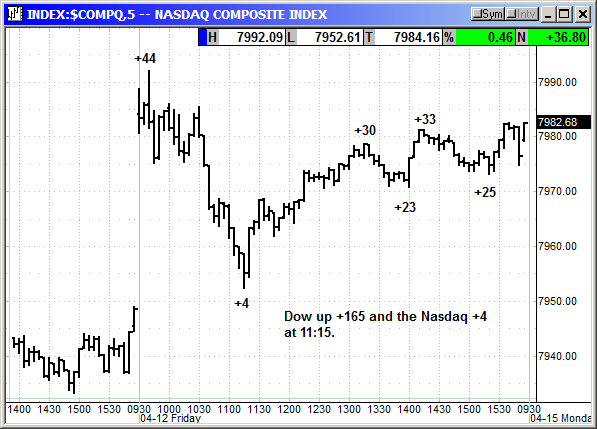 The Nasdaq is easing slowly higher and now only 125 points from a new high. There is no visible resistance in the way but there is congestion from September. It may not be a straight shot unless Netflix posts blowout numbers on Tuesday. Facebook is now leading the FANG pack with a 7-month high close on Friday while Amazon has stalled at $1,850. 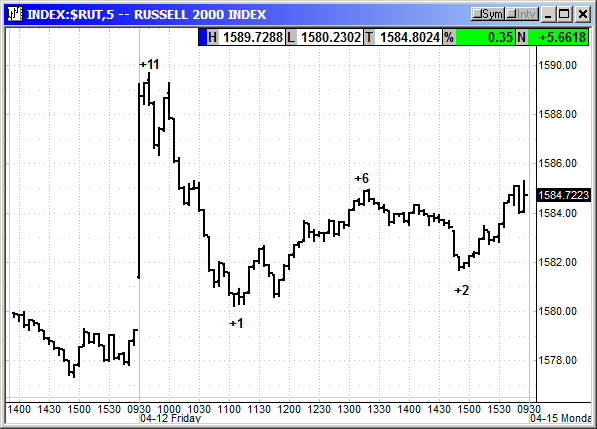 The Russell remains the laggard, but it is slowly easing up to that magic number resistance at 1,600. 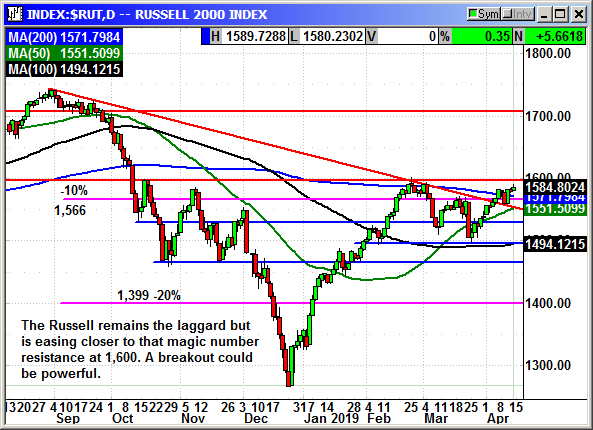 If positive earnings were to suddenly lift the Russell over that level a breakout could be powerful. I believe we will see new highs in the coming days. Positive earnings guidance will be the key. Moving materially over the prior highs could be a significant challenge but one I would like to see. 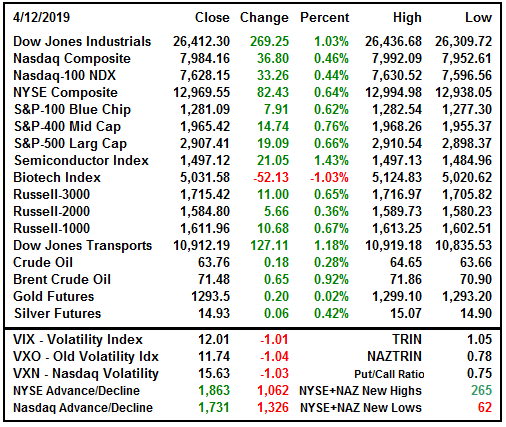 It is hard not to be bullish at new highs but as we saw from the three lowest volume days of the year last week, there are a lot of investors waiting patiently on the sidelines rather than chasing prices higher. Be patient. There is always another day to trade.